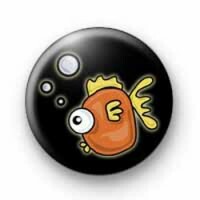 Orange Fish Button Badge in black with a really cute orange fish illustration. This cute orange fish badge has a really big eye and contrasting yellow gills and fin. This fish badge is always popular with schools & teachers love to give them out to their students. They are great if you are teaching about marine biology, marine conservation & ocean studies. They are really fun & also perfect to give to your kids if you are heading away on a summer holiday to the beach or seaside this summer. Also great for boat trips & holidays on a ship. We have a great range of marine & ocean inspired badge son the website. From fish & octopus through to seashells, our badges are fun & cute. We hand make all of our badges in our Uk workshop & deliver to customers all over the world. Free delivery available & we also offer a next day delivery option for those last minute badge orders.